All 24 episodes from the 12th season of the award-winning US drama following the lives of medical professionals at a fictional Seattle hospital. 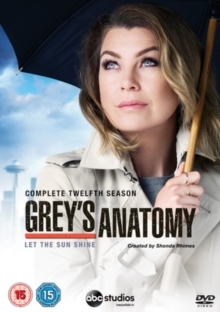 In this series, Meredith (Ellen Pompeo) struggles to deal with all her responsibilities after Amelia (Caterina Scorsone) moves in with her, while Miranda (Chandra Wilson) begins life as the new Chief of Surgery. The episodes are: 'Sledgehammer', 'Walking Tall', 'I Choose You', 'Old Time Rock and Roll', 'Guess Who's Coming to Dinner', 'The Me Nobody Knows', 'Something Against You', 'Things We Lost in the Fire', 'The Sound of Silence', 'All I Want Is You', 'Unbreak My Heart', 'My Next Life', 'All Eyez On Me', 'Odd Man Out', 'I Am Not Waiting Anymore', 'When It Hurts So Bad', 'I Wear the Face', 'There's a Fine, Fine Line', 'It's Alright, Ma (I'm Not Bleeding)', 'Trigger Happy', 'You're Going to Need Someone On Your Side', 'Mama Tried', 'At Last' and 'Family Affair'. Studio: Walt Disney Studios Home Ent.